Enjoy tapas-style dining at Julian Serrano in the casino level at Aria. Sangria and a 500 bottle wine list are available to accompany your meal. Specialty menus, including vegetarian, are popular choices. 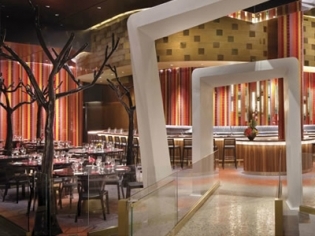 Experience the flavor of Spain right inside Aria in Las Vegas! Turn up the volume and fun with an eating experience at Julian Serrano’s, located in the Aria Hotel lobby. Enter through the funky white arches and revel in the colorful environment within; you will be surrounded by shelves of glitzy glassware, faux trees, red booths and Spanish music. The tapas style dining is conducive to sharing as many dishes as you can with your fellow diners and don’t forget to try their signature Sangrias! The tapas are little plates of delectable Spanish foods given a modern twist and stuffed with king-sized flavor. Along with the “not-so-traditional” tapas selections, several paellas are available, as well as a vegetarian and vegan menu. A 500 bottle wine list is heavy with Spanish influences and has a wide assortment available by the glass. At Julian Serrano’s experience a taste of Spain right inside Las Vegas!